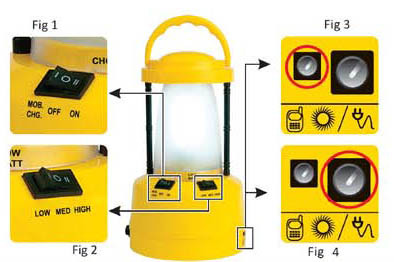 This rechargeable solar lantern has a 3 way switch with three modes of light. Lantern uses SMD type hi efficiency LED of total power not more than 3 Watts. The Lantern uses SMD type hi efficiency LED of total power not more than 3 Watts. The smaller socket on the right (fig 3) is for the 5-in-1 mobile charging lead provided with lantern . The bigger socket on the right (fig 4) is for charging the lantern. During charging the charge indicator will glow continuously,& on completion of charging the charge indicator will start blinking. The charging can be done either using the solar panel or through the AC adaptor provided with lantern. Always keep battery fully charged using solar panel or mains adaptor even if lantern is not in use for prolonging battery life. CHARGE LANTERN AT LEAST ONCE EVERY 15 DAYS . Please use pre-tested solar panel that is provided with this Solar Lantern for charging as using non-approved panels will nullify company warranty for battery. Battery used is 6V4.5Ah/ 6V 5Ah SMF VRLA type and using low brightness mode will increase back up time on a single charge. When Lantern is switched off, please ensure the 3 Way switch on the left is in centre Full OFF position. Do no attempt to open the Solar Lantern. Avoid exposing the Solar lantern to High Temperature and keep it away from Water.